Blackface -beyond college campuses and public scandals, a Racist Tradition lingers. ATLANTA — Nina Yeboah was a freshman at Georgia State University in 2004 when she heard about the pair of white fraternity brothers who had shown up at a "Straight Outta Compton" party in blackface. Fifteen years later, she said, it still feels traumatic to talk about what would become a moment of embarrassment and pain on the Atlanta campus. As a student of color, said Ms. Yeboah, now a writer, "it kind of wakes you up to what racism is like in the community that you're in." It has been a week of waking up. What first appeared as a grotesque act of racist clowning on the part of Gov. Ralph Northam of Virginia turned out not to be an aberration at his medical school in the early 1980s. A confession from Mark Herring, the state's attorney general, revealed that blackface was common at other Virginia schools at the time as well. The news of other blackface episodes — an ever-growing tally including yet more Virginia politicians as well as Floridaofficeholders — led a rush to old yearbooks by reporters and others across social media.This last week has reinforced that blackface, with its roots in demeaning minstrel-show traditions that date to the 1830s, has never gone away. In fact, it surfaces on a regular basis across the country, beyond the South and beyond the Greek houses on college campuses. Over the past two decades, there have been at least a handful of incidents every year, in Wisconsin, Oklahoma, Texas, Pennsylvania, Minnesota and Alabama, involving judges, police officers, bank executives and credit union employees. Just last year, a fraternity at California Polytechnic State University in San Luis Obispo was suspended after students dressed up as gang members, with one person in blackface. A candidate for the Illinois Senate apologized for dressing as a rapper in blackface at a Halloween party a decade earlier. And a student at the University of Arkansas posted on Snapchat an image of himself in blackface and the words "I hope this offends someone." 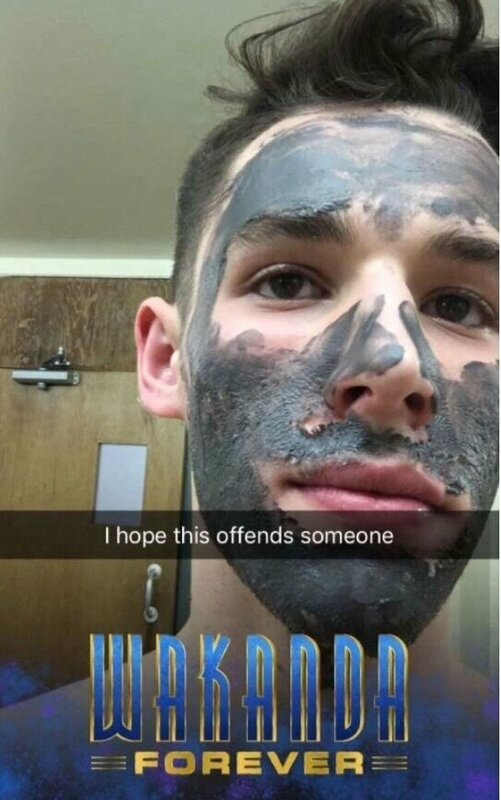 A student at the University of Arkansas posted on Snapchat an image of himself in blackface. "Black people in general have had to deal with a lot of these things that have happened," said Dr. David Randolph Sr., an oncologist in Richmond, Va., who graduated from Mr. Northam's medical school in 1983 and recalled going to a party in the early 2000s and seeing a white couple dressed in full blackface as Venus and Serena Williams. "Everybody except me and my wife kind of looked at them as a matter of course." The frantic apology that Dr. Randolph received from the couple underscores what seems obvious: Blackface now and from its beginnings has been known to be offensive, "the filthy scum of white society," as Frederick Douglass called it in 1848. That did not hamper its popularity. For more than a century it was in the mainstream of American pop culture, in Broadway plays and in Bing Crosby movies, before receding as the civil rights movement ascended. College fraternities and sororities — among the most segregated institutions in modern American life — became a common setting for the behavior. Before the scandal in the Virginia Capitol, universities had already begun to look deeply at the racism strewn across past yearbooks. At the University of Virginia, a commission that had been examining the institution's past found copious examples of blackface, racist cartoons and racist stories in fake "slave dialects" in the early 20th century. Similarly vile things have been found in yearbooks at the University of Richmond. Minstrel acts were a common part of campus life at many schools into the 1950s. As late as 1958, a sorority at the University of Alabama staged a blackface re-enactment of an event two years earlier when Autherine Lucy became the first African-American student to attend the school, before she was expelled. But with the rise of the civil rights movement, things changed. "It is much more private by the time you get to the '70s and '80s, even the mid-60s," said Anthony James, the division chairman of humanities and fine arts at Coastal Carolina Community College. Starting as an undergraduate at the University of North Carolina in the late 1980s, Mr. James, who is white, studied hundreds of Southern college yearbooks, prompted in part by seeing a 1979 U.N.C. yearbook photograph of a student dressed in blackface jokingly re-enacting a Ku Klux Klan lynching. He found that blackface had become much rarer by the 1960s, and when it did show up, it was in photographs of private fraternity parties rather than at campuswide public events like minstrel shows. The episodes portrayed, like that 1979 lynching scene, also seemed to be growing uglier. With few public photos, it is hard to say how rare — or how common — blackface became in this era. Cleophus Thomas Jr., the first black student government president at the University of Alabama, doesn't remember any episodes involving blackface when he was on campus in the mid-1970s. He recalled plenty of Confederate pageantry, but assumed that more explicitly racist theater, if it even happened, must have taken place behind closed doors, with "no one there to see them but the bartenders and the valets." In New Orleans in 1987, on the other hand, dozens of members of a fraternity that had already been expelled from Tulane University marched in blackface in a parade in broad daylight, and as late as 1997, members of that same fraternity at Loyola University invited students to celebrate Martin Luther King's Birthday "with fried chicken from Popeye's, watermelon and a 'forty'." "It wasn't really a shock," said Ryan C. Holmes, who is black and who went with 10 other students in protest to that party in 1997. Now an associate vice president for student affairs and dean of students at the University of Miami, Dr. Holmes said that things at many schools had not changed as much as people may want to believe. "It's gone inside," he said, "but it exposes itself every once in a while." By the late 1980s and 1990s on most campuses, blackface had finally become so taboo as to disappear completely from yearbook pages. When instances of blackface did become public — at an Illinois university in 1988, a high school in Missouri in 1990, a fraternity in Georgia in 1997 — condemnation followed as well as suspensions, firings and elaborate apologies, at least when people felt the need to apologize. To this day, many white people have bristled at the notion that blackface is inherently racist, arguing that it is a tribute to the person being imitated or, as Robert H. Michel, the Republican from Illinois who served as House minority leader, said in a 1988 interview, "just a part of life" that "was fun." 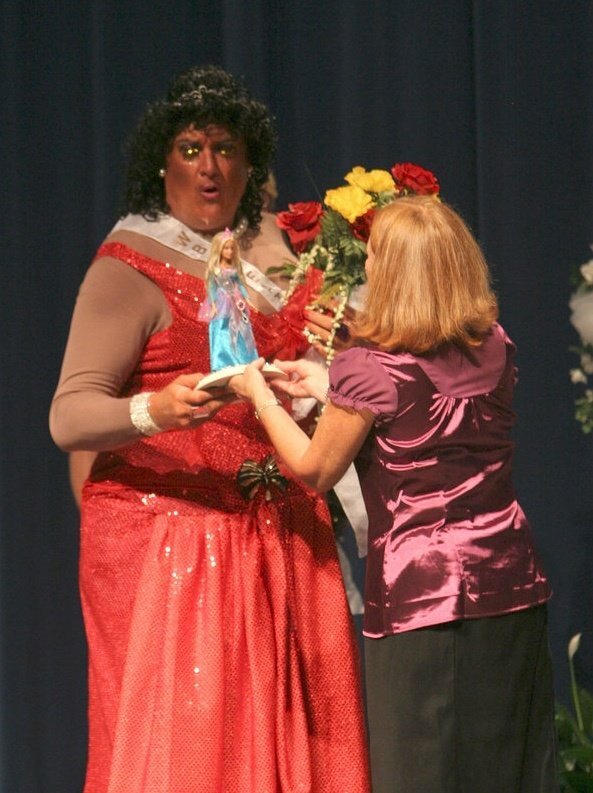 In 2008, Mel Kuhn, then the mayor of Arkansas City, Kan., appeared with a darkened face as part of a charity drag show. His character was inspired, he said, by movies like "Big Momma's House"; The Associated Press reported that the character's name was "a vulgar reference to female genitalia." Mr. Kuhn apologized publicly shortly after the performance after meeting with the N.A.A.C.P., but he sounded a defiant note this week. "There was no insult intended," he said, adding: "You've got to stop this P.C. nonsense, where if I don't say something perfectly correct, people just get disjointed." Thomas Venker, 70, a retired lawyer who is white, was a member of the Pi Kappa Alpha fraternity at Georgia State University in Atlanta in the late 1960s and early '70s. He said the fraternity in those days held a yearly "Soul Review" rush party that featured white members in blackface pretending to be groups like the Temptations and the Four Tops. "This was because we loved these entertainers," he said. "The black fraternities would look at our photo album book and laugh at our pictures, and thought it was funny that we would do that, and loved it." But in 2004, Mr. Venker's old fraternity prompted outrage on campus when two of its members showed up in blackface to the "Straight Outta Compton" party, the same event that pained Ms. Yeboah and many other black students. The fraternity was temporarily suspended from campus. 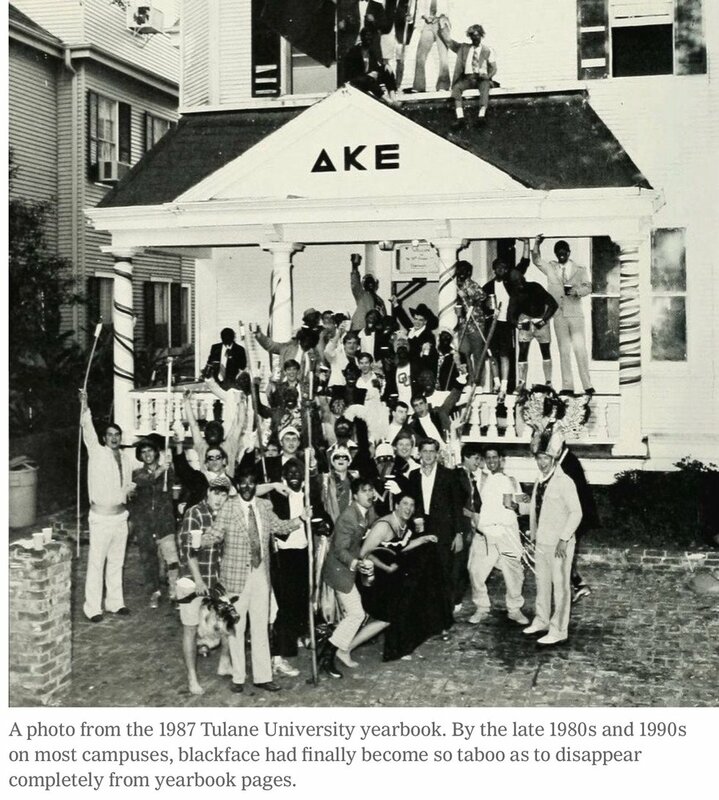 Mr. Venker filed a federal lawsuit on the fraternity's behalf, and eventually an arrangement was reached with the Black Student Alliance, of which Ms. Yeboah was a member, and which had also been suspended after promulgating a flier associating the fraternity with the Klan. All these years later, Mr. Venker still defends the 2004 episode much like he does the "Soul Review" parties. These were homages to black performers, he says, and "totally innocent." Eric Lott, an expert on blackface minstrelsy and a cultural historian at the Graduate Center of the City University of New York, who is white, called the practice "indefensible," given its roots in dehumanizing attitudes "rooted in the traffic in black bodies and slavery." And yet, despite the pain and the punishment, some white people seem inescapably drawn to it. "It's just one of the ways, theatrically and in everyday life, that white Americans appear to handle their relationship to the color line," Dr. Lott said. "And I'm not sure how you deal with that."